Bikes must be fitted with bells at the point of sale, but it’s not a legal requirement to fit or use them on the road. A much under-valued accessory; it is a percussive signalling instrument for warning pedestrians and other cyclists and a polite way of announcing your approach, especially if followed with a verbal greeting and request to pass. Also useful in such places as a canal towpath when you can’t see around the corner. The basic bell can produce up to 100db and is available in a variety of styles and sounds. There are basically two different types of classic bike bell that can be distinguished by the different types of ringers. One is with a mechanical operating part inside that works with gears to chime the bell and the other a simple ringer that chimes the bell from the outside, both types operated by using the thumb. There are many different ones on the market from simple flick bells with a single ding to ones that sound like an ice cream bell when flicked. 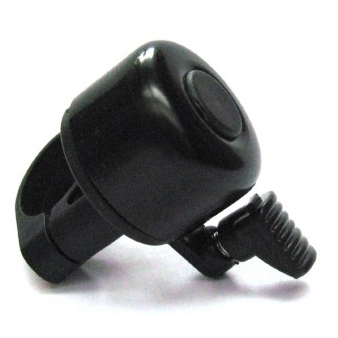 the main purpose of a bicycle bell is to alert people so, choose one that is loud and clear. Horns are much better in busy city traffic where bells are hard to hear. 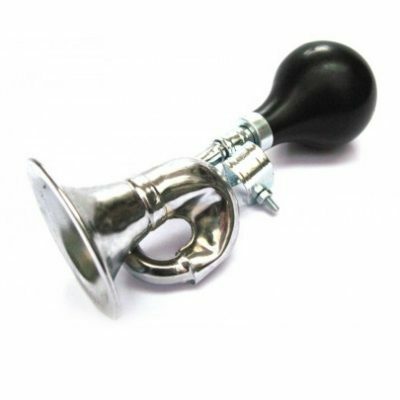 A classic bulb horn operated by squeezing a rubber bulb attached to a metal horn produces a single note which is much louder than the ‘ting’ of a bell. Other types of horns used include battery-operated horns or small air horns powered by a small can of compressed gas.